During the summer, the Suffolk Owl Sanctuary’s resident owls and other birds of prey demonstrate their exciting aerial skills to crowds of visitors. During this time most spend their days in the open-fronted weatherings and their nights in the mews room. However, now the shorter autumn days are upon us the talented flying team are released into spacious, naturalistic aviaries to relax for the winter. During this “down time” the birds will succumb to their annual moult. A moult is when the birds gradually replace their old plumage with new feathers. Birds’ feathers consist of keratin, the same substance that constitutes fingernails. It has been described as a “miracle substance” as it is very tough and strong, but also lightweight and flexible. Despite these qualities, over time, a bird’s feathers can become damaged - by rubbing together in flight, escaping predators, brushing against tree branches and by constant entering and leaving the nest during the breeding season. New feathers are necessary for efficient flight and insulation. Common to all birds, wild or captive bred, is the timing of the start of the moult - this always take place after parent birds have raised a brood. 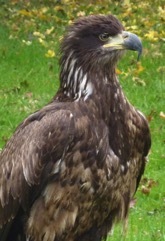 Once the young are fledged and can take care of themselves, the parents’ moult can begin. 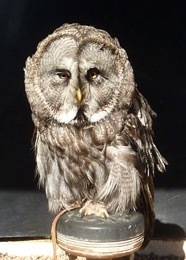 The rate at which owls and other birds of prey moult depends upon the weather and their body condition: in order for old or damaged feathers to fall out, the bird’s condition must be adequate to compensate for loss of plumage. If a bird is not fat enough to be well insulated, then it will not shed feathers until it has put on weight. At the sanctuary, all the birds are well fed and cared for, so the owls tend to moult more quickly and neatly than their counterparts in the wild. The process generally takes 3 or 4 months to complete, though this can vary from bird to bird. For example, Cobweb the Barn Owl is a heavy moulter early in the year. Consequently, he cannot take his place in the early flying displays at Easter, but joins them later in the summer season. The falcons and hawks moult symmetrically, in order that their flight remains smooth and aerodynamic - an uneven loss of feathers would cause them to wobble and loose height and speed when flying. The eagles moult more slowly than the smaller birds, as the loss of too many of their large feathers at once would compromise their hunting skills. They lose about a quarter of their feathers annually, so a complete moult will take about four years. In the wild, owls moult much more slowly, as they need to keep flying and hunting throughout the moult - a flightless wild owl would starve to death or fall victim to a predator if it were compromised by the loss of too many feathers at once. Wild birds will lose a few flight feathers each year until, over the course of 3 or 4 years, their plumage is completely replaced, which accounts for the discrepancy in colour in young, juvenile and adult plumage in many species of owls and other birds of prey. Having been born covered in pale, fluffy down, the birds gradually attain their mature dark feathers and distinctive adult markings. 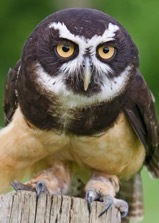 This can result from just one moult, in the case of most owls, to four or five moults for large eagles. 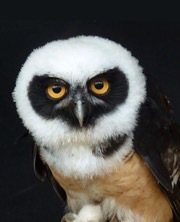 The head of a young spectacled owl, for example, is completely white. A full moult will be necessary before plumage settles into the characteristic adult pattern of dark head with white spectacles. Similarly, an immature Bald Eagle will not display its iconic white (bald) head until it has passed through five annual moults. Some of the sanctuary’s birds may, therefore, look slightly “scruffier” than usual after the breeding season but, hopefully visitors will appreciate that this transitionary period is necessary in order for all the birds to look their very best during the summer season.